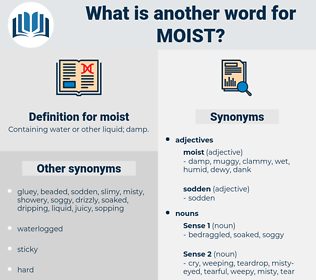 What is another word for moist? 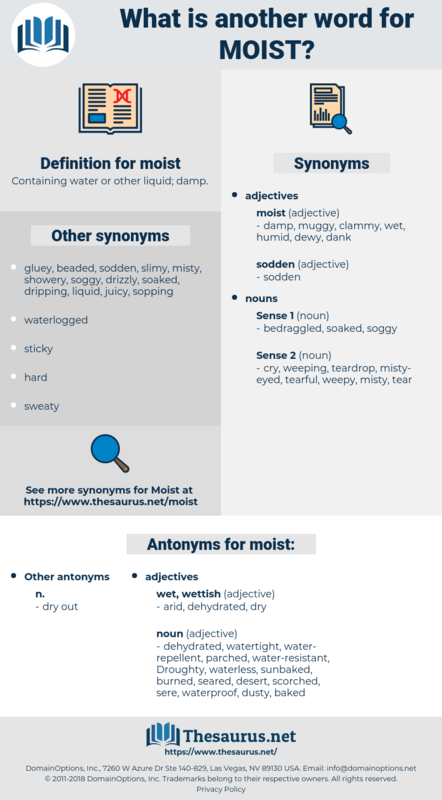 Containing water or other liquid; damp. dehydrated, watertight, water-repellent, parched, water-resistant, Droughty, waterless, sunbaked, burned, seared, desert, scorched, sere, waterproof, dusty, baked. Add three spoonfuls of flour, as much moist sugar, a little salt and nutmeg, the yolks of three, and the whites of two eggs. The good fellow's eyes were moist as he passed his hand over them. mankato, mink coat, masqat, mahayanist, mess jacket, masted, Massicot, mascot, mugshot, mysidae, monocyte, misdate, mimosoideae, muscoidea, masjid, missed, moonseed, misdeed, mosquito, mesquite, make it, massed, misty, maggoty, mainstay, musjid, make good, many-sided, monkey jacket, massasoit, mug shot, maggot, mst, mighty, manicotti, muskat, meshed, mainmast, misguide, make do, monkshood, masked, muskwood, muscadet, make out, make headway, majidae, misquote, machete, megahit, misstate, mashhad, munjeet, mujtihad, musset, Manx Cat, masochist, misty-eyed, mucoid, moon shot, mist, masthead, masse shot, most, muscat, monazite, mastoid, mouse-sized, mainsheet, maxzide, moquette, mukataa, minimized, Mae West, moss agate, monocot, misdo, musket, myacidae, monoxide, makeweight, massachuset, miscast, mast, Mucic Acid, Masoud, mussitate, Mao Jacket, mess kit, megawatt, minnesota, majesty, moose-wood, massicotite, mnemonist, musty, megadeath, maoist, misguided, musette, Mossad, muscidae, misused, make-do, monistat, musth, mixed, mujahid, Mexico City, mazed, must, max out, man-sized, mesquit, mikado, moosewood, might, magicicada, musd.